Emmanuel Sanders is an American football wide receiver for the Pittsburgh Steelers of the National Football League. 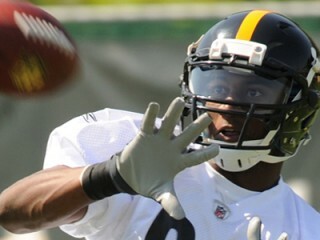 He was drafted by the Steelers in the third round of the 2010 NFL Draft. Sanders played collegiately at Southern Methodist University. PRO: Drafted by the Steelers in the third round (82nd overall) of the 2010 NFL Draft. Ranks as SMU's all-time leader in career catches, TD catches and yards, single-season and single-game receptions and single-season yardage…holds SMU records for career 100-yard-receiving games with 16 and season 100-yard games with six (2008)…only player in SMU history to record four 600-yard receiving seasons - no other receiver has three…sociology major. 2009: Started all 13 games, earning first team All-C-USA honors…had 98 receptions for 1,339 yards and seven touchdowns…returned 20 punts for 275 yards and one touchdown…averaged 124.6 all-purpose yards per game…ranked sixth in the NCAA with 103 yards per game receiving…his 98 receptions were seventh best in the NCAA…finished his career as SMU's career leader in receptions (235), touchdown catches (34) and yards (3,791)…in his final game, had seven catches for 124 yards and a score in helping SMU to a 45-10 win over Nevada in the Sheraton Hawaii Bowl…earned honorable mention All-America by SI.com. 2008: Earned second team All-C-USA accolades...started the first 10 games, catching 67 passes for 958 yards and nine TDs...ranked 11th in the nation with 95.8 receiving yards per game and 19th with 6.7 catches per game...finished the season as SMU's career leader in TD catches (27)...set a new SMU season record with six 100-yard games in 2008...became the first player in SMU history to record three 600-yard receiving seasons...caught three TD passes in the Texas State win...had a season-high 132 yards receiving against Tulsa...named to the College Football Top Ten & Pegasus News All-DFW College Football Team. 2007: Started all 12 games...an honorable mention All-C-USA selection by the league's coaches...caught 74 passes for 889 yards and nine TDs on the year...the 74 receptions rank as third-most ever in a season at SMU and the 889 yards rank fourth...caught 13 passes - and three TDs - in the season finale at Memphis and 10 passes in the UNT win...had three 100-yard games - Arkansas State (100), Tulane (155) and Memphis (118)...also handled punt returns and finished with 183 yards on 20 returns...had a season-long return of 33 yards against Rice...co-winner of the team's Wild Horse Club Award along with Justin Willis. 2006: Named an honorable mention Freshman All-America at both wide receiver and kick returner by The Sporting News...was an All-Freshman Conference-USA pick at both spots by both the coaches and the media...second-team All-C-USA selection by the Houston Chronicle, a third-team choice by the media and an honorable mention pick by the coaches...co-winner of the James Bradley "New Mustang" award for consistent play along with Bryan McCann and Justin Willis...caught TD passes in six straight games (Sam Houston through ECU), breaking a 29-year-old SMU record for consecutive games with a TD catch...recorded team-highs with 46 grabs for 605 yards...had a team-best nine receiving TDs - the most ever by a freshman at SMU and the second-most in a season ever at SMU...his 151 receiving yards against Houston made him the first SMU player with 150-or-more receiving yards since 1998...had pairs of TD receptions against Houston and ECU...returned kicks and ranked second in C-USA with a 24.0-yard average. 2005: Redshirted as a true freshman. First-team all-district performer at three positions - back, wide receiver and safety at Bellville High...had 66 carries for 499 yards and six TDs as a senior...hauled in 24 catches for 414 yards and a score...also threw for a touchdown...recorded 49 tackles and three interceptions on defense...named team's MVP...Tri-County Offensive Player of the Year...earned seven All-District honors during his high school career...four-sport letterman - football, baseball, basketball and track…Full name: Emmanuel Sanders. View the full website biography of Emmanuel Sanders.